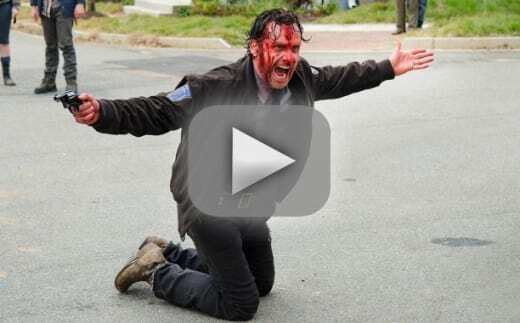 That was SOME final scene on The Walking Dead Season 5 Episode 15. Rick Grimes was going all in against Pete and Pete wasn't backing down either. If not for Michonne stepping in one of the men might be dead. One of them might end up that way after next week. 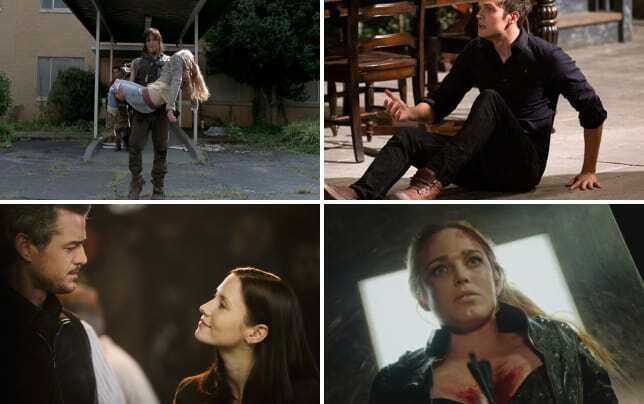 The body count is usually high on The Walking Dead season finales. Has Rick gone totally crazy? 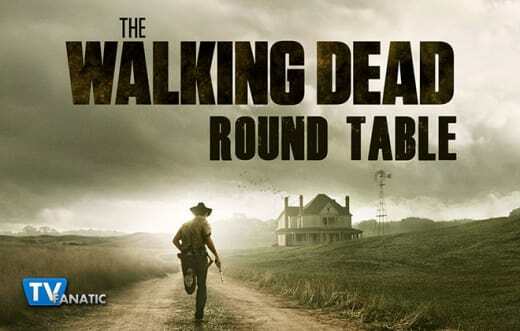 The Walking Dead Round Table panelists (Eric Nordhoff of The Walker Stalkers, Whitney Evans, Sean McKenna, and Miranda Wicker) attempt to answer that question and more below. What was your favorite quote or scene from "Try"? Whitney: I kind of loved crazy Rick at the end, if only because it gave a rather slow episode an exciting finish. And the sight of Michonne knocking Rick out was a gasp-worthy moment. Eric: Keep Walking. Pete and Rick were destined to have a confrontation. Sean: That scene with Glenn and Rick talking about what happened. I love him telling Rick that they are "them" and wanting to make it work, especially for Noah. Miranda: There was something especially perfect about whatsherface burning the sympathy card Carol penned to accompany her Sadness Casserole. I get why we send food and cards when people die, but in her shoes, I would probably have done the same thing. Exile or execution for people like Pete during a Zombie Apocalypse? Whitney: It's easy to think you'd spare human life and exile bad people during the Apocalypse, but I imagine it's probably smarter to execute people who are hurting others and becoming a danger to the group. However, sending someone off into that world alone, may be worse than death. Eric: What’s missing is a system of laws in this little community. And, the mayor is doing a poor job of setting the standard. I don’t think execution or exile is the right answer. If he’s abusing his wife, he needs to be put away in prison indefinitely and Aaron needs to scout for another surgeon! Sean: I really like Eric's idea. A prison seems like a good idea instead of risking an exile where he could come back with bad guys. It's such a tough predicament but then again, that's The Walking Dead. Miranda: Agreed, Eric! When Rick was talking to the Senator I was like "Why don't they have a place to put people who do stuff like this?" There's a reason the first two structures in settlements were the church and the jail. Why do you think Rick is so attracted/attached to Jessie? Whitney: Is this a storyline from the comics? I'm kind of confused why she is the person Rick has suddenly become so transfixed by. They've encountered a lot of women on their journeys and I'm not entirely sure what it is about Jessie that Rick has gravitated to. Maybe she reminds him of Lori? Eric: We all have a need to love and be loved. She’s attractive and vulnerable. He is desperate to be a hero for someone. She’s a match! Sean: I think their relationship has moved far faster than it should have, but maybe Rick not having to worry about walkers every moment has allowed him to think about finding someone for him. Or who knows. He did go into crazy mode, right? Miranda: Rick is a person who needs to save people. Before the apocalypse he was a cop, a protector. It's in his blood. His people are safer than they've ever been so he's looking for people to save on the inside. Jessie's the first to catch his eye. Who is behind the W carvings in the heads of walkers? Whitney: Not sure but I think we'll get a glimpse of this person in the finale and I'm betting they will be the next big bad. Eric: These ‘wolves' are going to emerge this episode, I’m sure. I’m desperately curious, but I really have no idea. Sean: It's got to be some other group out there, but I'm sure we won't find out until next season. Miranda: I'm so very intrigued by this story and where it's going. It seems the carvings are placed there BEFORE people die, or shortly after death but before they've turned. And why are they gutting and dismembering bodies? WHAT are these people!? Loosely related to #4, where is Morgan? Whitney: I'd almost forgot Morgan was out there! He's probably not far from the community and when everything goes to crap, I bet he'll swoop in at the right moment. Eric: Morgan has been tracking Rick’s group. He will emerge this episode somehow. Some people online theorize the Wolves already killed or captured him. I would believe the captured part more than killed – would be anti-climactic. Sean: He's doing Morgan things. Hanging out in the wilderness, killing walkers. Miranda:...creating elaborate structures to deter walkers from getting to him... As interested as I am in the Wolves story, I'm most interested to learn where Morgan has been and what he's been doing. He's been tracking them this entire time and he's obviously very good at keeping himself hidden. Whitney: When Shane became a problem, Rick was there to stand in opposition to him. 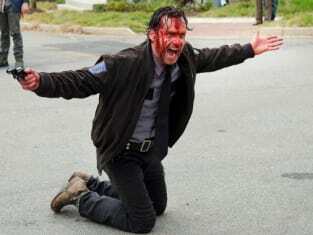 But now that Rick has become a problem, there's no one that can or is willing to really go against him. I'll be curious to see if everyone will blindly follow Rick's ideas next week or defy him. Eric: I secretly loved seeing him like that. Rightfully so, this place is frustrating. Rick can’t be anything but in charge and he resorts to his most animalistic primal instincts in this episode. He’s a dangerous man, but it’s almost justified. Sean: I can understand, especially after everything the group has gone through. Suddenly living in a "normal" world after all the danger and situations he's had to deal with would probably make him go a little crazy. All that playing house is just not working for him. And Pete's not a good guy, so there's that. I'm just interested to see who will follow Rick's lead now. Miranda: Pete is definitely not a good guy. Not at all. Rick, unlike Shane, isn't doing bad things to ensure his own survival. He's looking out for his group AND the Alexandria people. They don't see it, but he sees the threats against them. Shane's crazy was motivated by jealousy and that's never a good look on anyone. The Walking Dead Season 5 Episode 16 airs Sunday night at 9:00 on AMC and will run for an extra 30 minutes so update your DVR! If you miss it, or if you've missed anything this season, watch The Walking Dead online before Sunday night!